Patterns come into their own when you analyze stock trading charts if you use them to identify a trend reversal. No matter how a trend comes to an end, chances are good that a pattern exists to identify it. These reversal patterns are ones you should be able to recognize. A minimum of ten days between the two lows and sometimes as long as two or three months. Variation between the two lows should not be more than 4 percent. A center up move of at least 10 percent from the lower of the two bottoms. The price must rise above the confirmation line to confirm that the pattern is indeed a double bottom and the forecast of a continued rise is correct. The confirmation line is a horizontal line drawn from the highest high in the middle of the W. The point where the price rises above the line is called the confirmation point. Some of the price bars break the lines you draw to form the double bottom pattern. Breaking some of the bars is allowed in a formation where the line is not a support or resistance line. Also, the pullback is a retracement to the downside right after the price breaks the confirmation line. 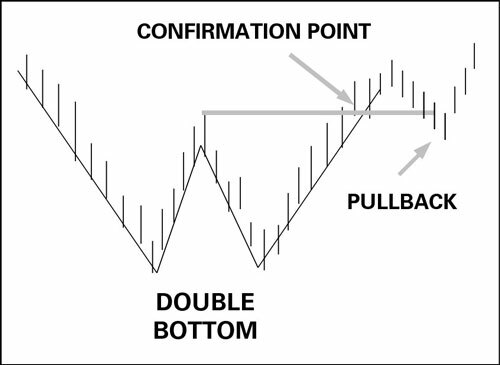 A pullback occurs 68 percent of the time in confirmed double bottoms, making it hard to trust your pattern identification. Often, the two lows of a double bottom are separated by several months or even a year, and you can easily miss the pattern altogether. Also, minor retracements and even other patterns within the W can obscure the pattern. Some analysts note that big patterns lasting months are easier to see on weekly charts that skim off the aberrations in daily data. A double top is the mirror image of the double bottom — it looks like the letter M. In a double top, the price makes a high, pulls back on profit-taking (as usual), and then bullish traders try but fail to surpass the first high. A true double top is usually accompanied by falling volume as the second top is being formed. Like with double bottoms, the price pulls back after the confirmation 69 percent of the time, causing you to doubt the pattern. Fortunately, the pullback period averages only ten days before the downtrend resumes. A triple top or bottom is somewhat rarer than the double version, but the meaning is the same — the price fails to surpass the previous low or high, signaling a trend reversal. The head-and-shoulders pattern is a triple top that’s easy to see: One bump forms the left shoulder, a higher bump forms a head, and a third bump forms the right shoulder. The head-and-shoulders pattern is the most widely recognized of all the patterns, and deserves its popularity because when the price surpasses the pattern’s confirmation line, it delivers the expected down move a whopping 93 percent of the time. The confirmation line connects the low point of each shoulder and is named the neckline. 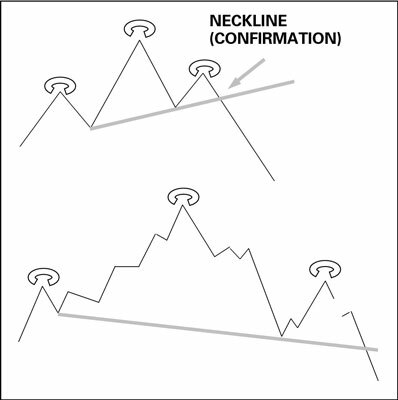 The price breaking the neckline predicts a price decline, whether the neckline is sloping upward or downward. Seldom do you see the neckline perfectly horizontal. A downward-sloping neckline tends to deliver the biggest price move. Like with every trend that’s losing steam, volume falls after the head, although about half the time, the highest volume is at the left shoulder and about half the time at the head. Volume is low at the second shoulder. Volume on the breakout day and the next few days after the breakout day, however, tends to be very high because by now a great number of chart-oriented traders have identified the pattern and its neckline.